I recently changed my relationship to online communication. I prefer to not feel pressure to perform in relation to multitasking. I check my e-mails twice a week. People get use to it. My brain seems to belong to the pace of the early 1990s. My eyes still don’t like to work in front of screens even after I bought one made out of platina. But it is a long time since I wrote longer fragments of text to a friend like this; it seems like deeper friendships happen more where we are physically based nowadays. I’m not sure if it make our relations extra fragile, temporary, more intense and shorter-lived? We constantly re-schedule our face and Skype times. Our generation stop to pick up our phones for calls. It is rare for us to gather all at once. DNK – Den Nya Kvinnogruppen literally translated into English would be The New Women’s Group. Founded in 2013 with a name echoing their and /our artistic matrilineages, DNK are engaged in cross-generational dialogue with artistic and feminist practices from the late 1960s and 1970s, when the home became a stage and the personal political. Anna Nordström, Evelina Hedin, Hilda Hellström, Kakan Hermansson, Malena Norlin and Åsa Norman came together around their shared desires and values in politics, art, craft, solidarity and feminism, to keep in touch. DNK act for change within art and craft contexts, and for refusal of the individualistic, success-focused, capital-driven, neoliberal society. They do this without neglecting their different everyday material-based practices in their own studios, where hands continue to form and shape glass, textile and clay in our world. Because details make a difference. As a collective they do exhibitions, workshops and talks where power, kitsch, taste and class are put on display, whose hands are in touch with what and how? It might become a female bondfire! Graphic design made by Rosie Eveleigh. Eveleigh is from UK and currently enrolled in the program for Graphic Design at ArtEZ Institute of the Arts in Arnhem. 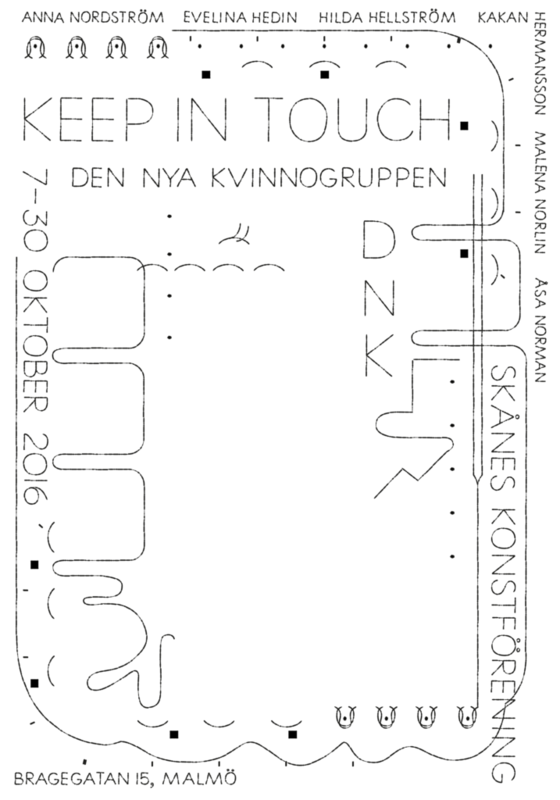 The exhibition is composed and the text is written by the visual artist Angelica Falkeling. Falkeling is currentley enrolled in the Master of Fine Art program at Piet Zwart Institute in Rotterdam.